Some children see braces as a rite of passage and an exciting step on the path to adulthood. Others view braces as just one more thing to make adolescence that much more difficult. And then there are adults who cringe at the thought of paying for youth braces. Here’s the reality: braces have become much more comfortable and attractive and affordable than just a few decades ago. They don’t have to overwhelm a young person’s face, interrupt their lifestyle or favorite activities, or break you financially. When you give your child the gift of an aligned smile, they are set up for a lifetime of good oral health. Straight teeth are easier to clean, which means fewer cavities or other oral health problems, and an attractive smile is important no matter what your child goes on to do with their future. Phase 1 orthodontics, also known as interceptive orthodontics, can begin as early as age 7. Plenty of baby teeth are still in place, some adult teeth have erupted, and your child’s jaw is still growing. Addressing certain conditions early instead of waiting for the tween and teen years can make continued future treatment easier on the patient, shorter, and less involved. Correct the position of the jaw or dental arch. Guide the growth of the jaw bones to accommodate erupting teeth. Lower the risk of breaking or damaging protruding front teeth. Correct harmful oral habits that are impacting development, like thumb sucking. Prevent an alignment problem from developing. Allow for correct biting and chewing. Improve your child’s appearance, self-esteem, and the function of their teeth. Early orthodontic treatment may be appropriate to intercept a developing problem before it becomes severe. Interceptive orthodontics are often appropriate for open bites, deep bites, overbites, cross bites, crowding, spacing, missing teeth, or teeth that emerge in the wrong place. Keep in mind that interceptive braces are a carefully considered approach. Often, functional appliances are used to fix or improve a problem, such as an expander, upper braces, a tongue crib, or a space maintainer. Your orthodontist will only recommend Phase 1 treatment if it is appropriate and can simplify or expedite later orthodontic treatment. Undergoing Phase 1 orthodontics does not mean that your child will completely avoid braces as a teenager. Around age 12, children are again evaluated for orthodontic treatment. This is typically the age when all baby teeth have been lost and 12-year molars have erupted. The timing behind all orthodontic treatment is important, and each case is customized to complement the child’s dental development and oral growth so invasive procedures can be avoided later. Move teeth into their permanent and final positions. Improve the function of teeth. Normal orthodontic treatment typically involves the placement of youth braces on both the upper and lower teeth once most or all permanent teeth have erupted so that the bite can be fully corrected and teeth fully aligned. If your child underwent Phase 1 orthodontics, they may still need Phase 2 orthodontics because the first phase does not necessarily correct all bite- and alignment-related problems. If Phase 1 is successfully completed, Phase 2 should be significantly reduced thanks to the early correction. Clear or white ceramic braces. Lingual braces (behind the teeth). 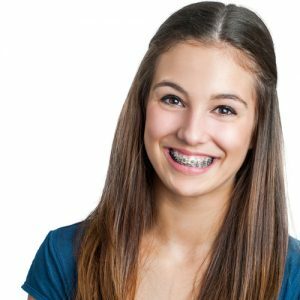 Does Your Child Need Youth Braces? Every child, by age 7 or 8, should undergo an orthodontic evaluation to determine whether they may be a candidate for interceptive orthodontics, will need braces as teens, or are fortunate enough to have teeth that will require zero intervention. Being referred to an orthodontist by your family dentist does not automatically mean your child will need braces, it is simply an appropriate evaluation to undergo at a young age so any orthodontic needs can be identified early and a treatment plan determined, even if your child will not get braces right away. If your child needs to be evaluated for interceptive orthodontics or full orthodontics, schedule your consultation with Dr. Roberts or Dr. De Marsche in their Center City, Philadelphia, or Lawrenceville, NJ, orthodontics office.